American Horror Story Freak Show: Orphans gives Elsa the chance to mourn about the loss of one pin head, the male version of the duo named, appropriately enough. Salt. At the start of the show an inconsolable Pepper refuses to leave the corpse of Salt and the other freaks are trying to persuade the mourning woman that the body must be moved. Elsa speaks of how much she is effected by the death of one of her monsters. Desiree is reading to Pepper and when she attempts to leave, the pin head throws a fit. Elsa and Des speak of it and Mars reveals the backstory of how she obtained Pepper, Ma Petite and Salt. Before you ask; no, no-one looked like that at my session. Today was my first rehabilitation session with the Cardio group. I think that I was the youngest, but there was one other chap (a foreigner like me) who may have been a year or two younger. Either way, he and I were the “youngsters” of the group. Having to wait for over seven and a half months to do my rehab, I was a little excited and a bit worried. I got there way too early and felt awkward as hell sitting in the hallway while waiting for the Physiotherapist to call me and the other “heart” patients in. When I first got there a chap with a goatee who was being wheeled into an operating theatre waved to me and said, “Oh, hi Mike.” I nodded back and then spent the next twenty minutes wondering, ‘Who in the hell was that?’ It is at times like these that my idiotic vanity about wearing my glasses frustrates me almost enough to start wearing them. In the interim, more folks gathered in the hallway and we were all called in together. I and two other folks were the “noob’s” of the group and got special attention. I do not know about the other two (a chap and a woman) but I felt stupid and clumsy. Not to mention the fact that I had to slow myself down. At first, I felt that all the exercises were too easy. I was annoyed that I’d had to spit out my nicotine gum and I was beginning to think that all this had been a complete waste of time. This will give you an idea of this “killer” exercise. Again, none of my session mates looked like this. A good start to my eight week program and one that I expect to benefit greatly from as well as enjoy as the ladies running it make this whole thing a fun experience. My new diet is another matter entirely. My first session last week with the Cardio specialist was an exercise of a different sort. I sat there dumbfounded for most of it. The reason? Tuna fish in a tin (can) has no Omega 3. Zero. Zip. It’s something to do with the canning process. If it isn’t fresh (and who can afford that on a regular basis, I ask you) it isn’t healthy. Salmon, mackerel, sardines, pilchards and kippers all are chock-a-block (full) of the stuff; tinned or otherwise. Now the only thing wrong with this list is that I only really like sardines and pilchards. So it’s going to be the Omega 3 supplements for me I’m afraid. Everything else is too damned fishy and oily. Salad for my main meal (tea in this country, dinner in the US) is okay, but, it needs to be full of peppers, onions, carrots, et al, for it to be of any real benefit. This new fad of “5 a day” that is being almost literally shoved down our throats dictates that even loaded with the maximum of goodies, salad does not even equal one of that five. Okay! I heard you the first time! I did explain that after my heart attack and surgeries that I did not eat that much. It is pretty much impossible for me to have five of anything per day! I also pointed out that if I increased my food intake, my “measurements” for the healthy zone were going to be shot. On the positive side, I was told that my occasional ingestion of eggs and low-salt, low-fat bacon was okay. That my move away from meat as my main staple, while not necessary, was nonetheless helpful. I was also told that low-salt was a misnomer because no matter how high the salt content is, it is still salt. I was also told to stop eating the fancy (spelled expensive) margarine since to get it to actually lower my cholesterol I’d have to eat gallons of it. A good old olive oil based margarine was just as efficient and cheaper. As I sit here feeling comfortably healthy and full from my mackerel and toast snack, I am looking forward to my next week’s session and my salad for tea. Perhaps I can work up to this “5-a-day” requirement, but, I’m not holding my breath. The BBC News Magazine put this on their page today – A “super breed” of slugs has arrived from Spain, but are they a threat to the UK’s native slugs? I knew there was something going on here. I’ve noticed that our back garden has been covered in slugs over the last few days. I am not talking about five or ten, I’m talking an amount of slugs that is reaching Biblical proportions. I mentioned this to my daughter. “You always exaggerate.” This was said while she edited her latest video. “The amount of slugs and snails goes up when it rains. You know that.” All this was said in a very calm “voice of reason” tone. “Not like these.” I said. I was standing at my French doors looking into a garden covered with the slimy things. I stopped counting after twenty. And these puppies were huge. The BBC article said they grew up to ten centimetres. I had to convert this via the net as I grew up in an inches and feet generation. So in real terms of measurement that is about four inches long! So according to the article these monster Spanish slugs are a threat to the UK slug. My first reaction, well besides the I knew part, was good. Anything that gets rid of any slugs is a good thing surely. But further reading, combined with my personal sightings of the disgusting creatures, gave me cause for concern. These Spanish ‘stealth’ slugs can out breed the English slug by a lot. The stealth slug reproduce “aggressively” pumping out about four hundred eggs per cycle. Slugs, the article helpfully informs us, are cannibals. 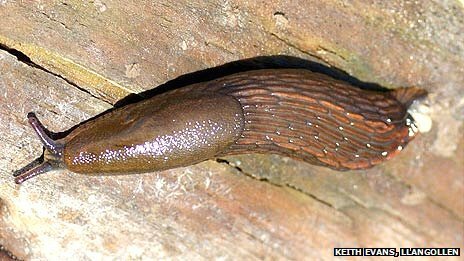 So the rapidly reproducing stealth slug is also introducing diseases and bacteria that is lethal the the UK slug. So not only are the Spanish slugs killing our slugs, but they are feeding on them as well. No wonder their numbers are growing. The article also helpfully points out that as slugs are cannibalistic as their numbers increase they can cause road traffic accidents. How? Well so many of them cross the road that the surface gets slimy and cars lose traction. Supposedly Norway has had a similar problem with the Spanish slug as well. I’ve been looking out at my back garden this morning and checking to see if any more slugs have appeared. They seem to hide when the sun comes out, so it is difficult to see if the population has increased. I working on a plan of action. I seem to remember my Grandmother telling me that salt gets rid of slugs. I might just give that a go. But I’m a little worried. The Spanish slugs are so big, I’m afraid they might just be able to defend themselves. Hell, they could even attack when threatened. If you don’t hear from me again, you’ll know they got me.